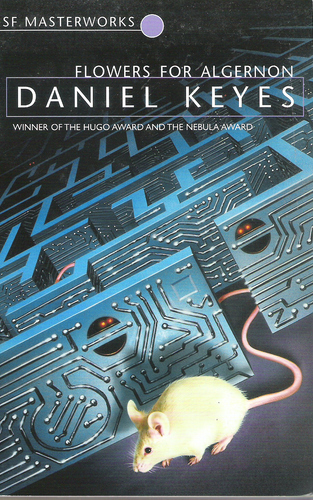 We discussed ‘Flowers for Algernon’ by Daniel Keyes at my book group last night. The main character, Charlie, has a job sweeping up in a bakery. He has a low IQ but longs to become ‘smart’. He takes part in a medical experiment to increase intelligence, which includes the doctors operating on his brain. A mouse called Algernon who previously had this operation has become a super intelligent mouse and can run through complex mazes. Charlie’s IQ soars and he becomes a genius. But does Charlie’s increased intelligence bring him happiness? Charlie was happy working in the bakery and believed he had good friends there. His increase in intelligence makes him painfully aware that his workmates were not laughing with him but laughing at him. Other people cannot cope with the change in Charlie, and Charlie struggles to cope with his new life. Inevitably, there is much sadness in this story, but there is also warmth and humour. The novel is categorised as science fiction, but I’m not sure that it comfortably fits this genre. I suppose it depends how we define science fiction. When Algernon begins a rapid decline, Charlie is aware that soon the same will happen to him. He becomes painfully aware of starting to lose his intellectual abilities. I suppose this is what people can go through as old age approaches, and particularly with the onset of dementia. The novel raises many questions: What is intelligence? What are the benefits and ethics of medical intervention? How do we view people different from us? Because of the many issues it raises, I think this is an excellent novel for a book club discussion. This entry was posted in Books and tagged Daniel Keyes, Flowers for Algernon, intelligence, medical experiments, science fiction by Jean Davison. Bookmark the permalink. Yes, it’s certainly a book that will linger in my mind long after reading it. Have you read the original hugo-winning Novella? This is the novelization of the novella — I found the original a little more powerful. Thanks for commenting. I remember reading that this story was originally written as a novella, but, no, I haven’t seen the novella.